I love Corned Beef! My favorite way to have it is on couple of pieces of Rye Bread, smothered in sour kraut and mustard, topped with gooey swiss cheese…grill it and I’m good to go! 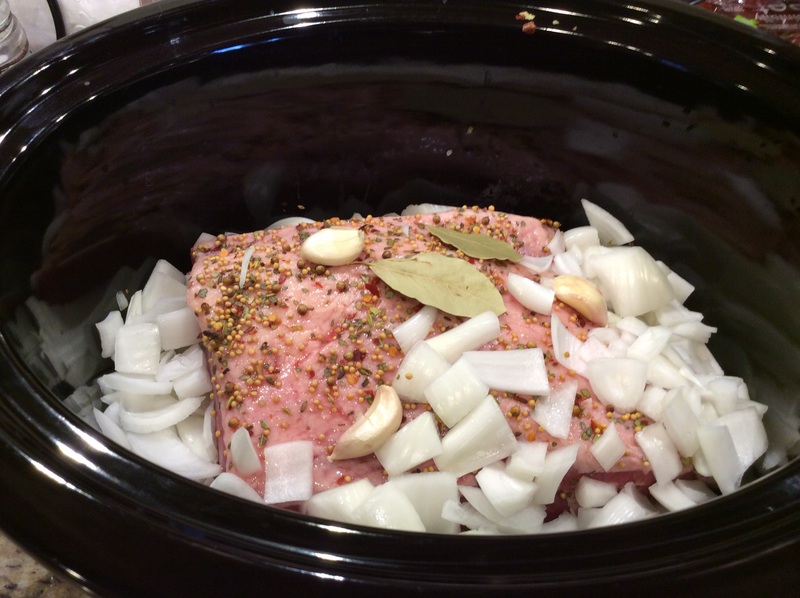 You can always get excellent Corned Beef at your local market, too but every year around St. Patrick’s Day, you may get a little motivated to make it yourself when you see all the tasty pieces of brisket in the meat department. If so, I have got the recipe for you! It is one that I have tweaked over the years and I think I have finally got it as close to perfection as possible…(Patting myself on the back now..ha, ha). The best part about it is that it is prepared in the crockpot so you don’t have to babysit it! At the end, just pull it out and put it under the broiler for a few minutes so you still get that beautiful crust on the outside. 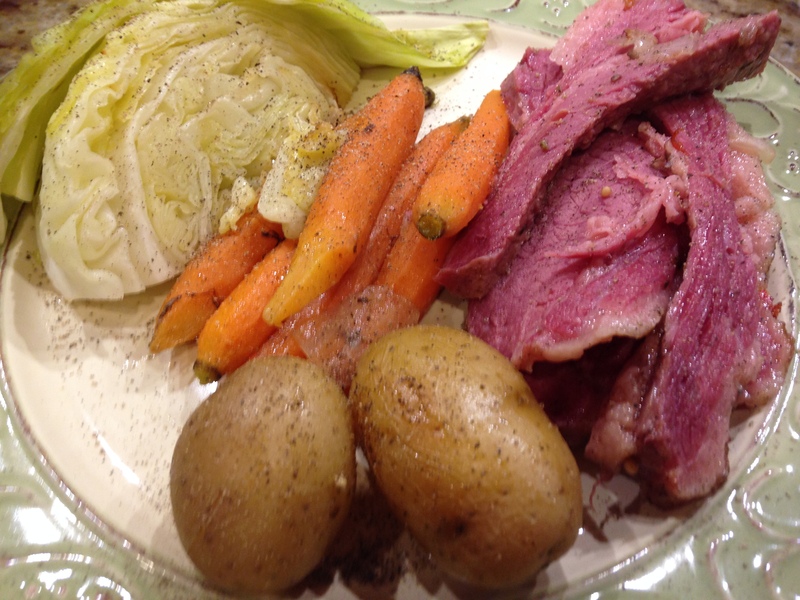 This is a great recipe because you have a delicious one pot meal of corned beef, potatoes, and carrots (I serve a Roasted Cabbage wedge with it that is also amazing), and the leftovers you can use to make a hash or that perfect sandwich I was talking about earlier! It is no fail and I promise, you will receive many compliments! So, here you go…. 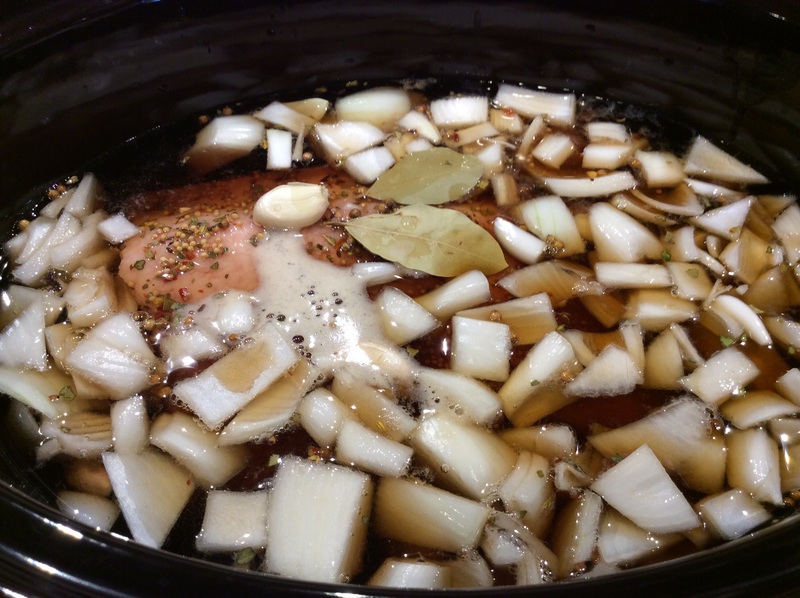 Place corned beef brisket, fat side up, into crock pot; sprinkle with pickling spice. Add onions, garlic, bay leaves and cloves. Cover and cook on low heat for 4 1/2 hours. Add carrots and potatoes and cook an additional 2 1/2 to 3 hours (or until veggies are tender). 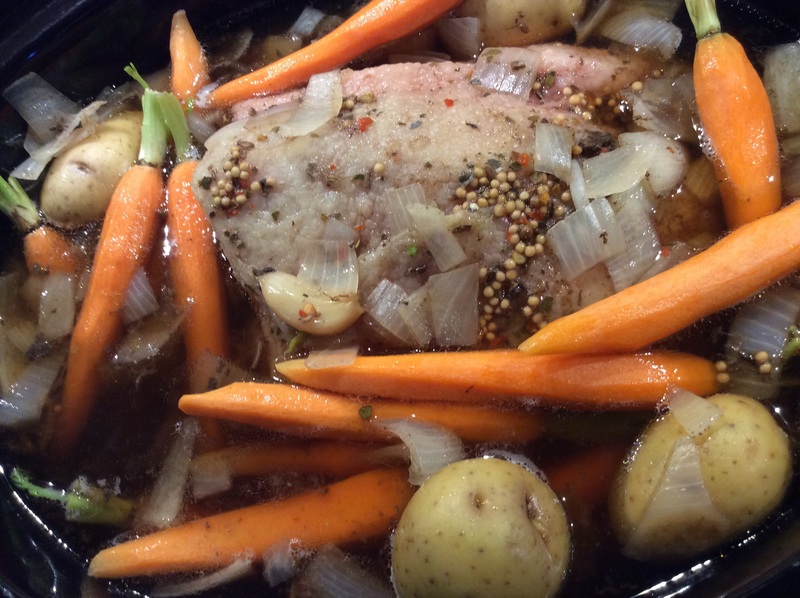 Remove corned beef from crock pot and put in an oven-safe dish spreading the carrots and potatoes around it. Broil on high for 5-7 minutes until you get a caramelized crust. Remove corned beef and let rest for 5 minutes. 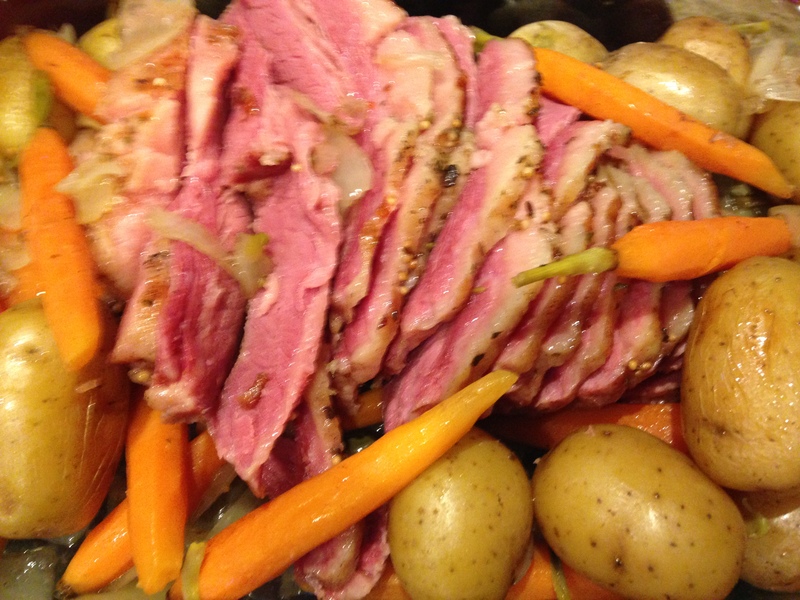 Thinly slice the corned beef against the grain and place it back in the dish with the carrots and potatoes. 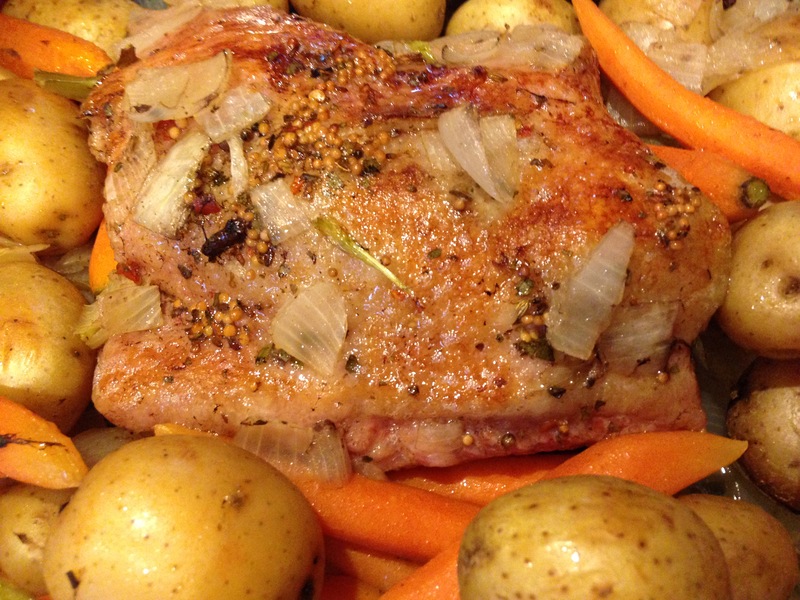 Bottom Line: This recipe is so good and so easy, you will not want to wait for St. Patrick’s Day to have it! You can always add some chopped cabbage right on into the crockpot as well but I love the crunchy, crispiness of the oven- roasted version. I hope that you give this a try tomorrow in your kitchen and let me know how it turn out. I am Chef Frankie…always in the kitchen and always cooking with “wild abandon”! This is the easiest recipe ever and all it calls for is a head of cabbage, olive oil, salt, pepper, and some fresh lemon juice. Cut your cabbage into 8 wedges (removing the core from each wedge) and place on a baking sheet. ,one side with olive oil and sprinkle with salt and pepper. Turn over and repeat on the other side. Bake 15 minutes on each side at 400 degrees. Sprinkle fresh lemon juice over the wedges and you will love this so much, you may never eat cabbage another way..ha ha! ← Pork Carnitas…A Perfect Mexican Treat for Game Day!